Russia was featured for the first time at the New York Times Travel Show. Source: Press Photo. 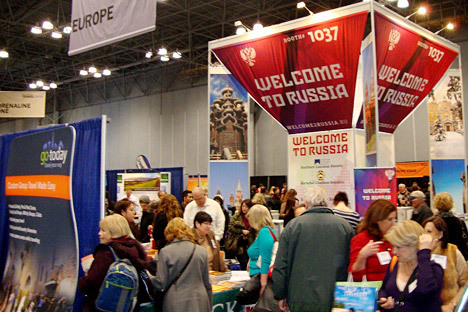 Russia was featured for the first time at the New York Times Travel Show tenth anniversary, a giant showcase of traditional costumes, singular souvenirs and destination deals from January 18-20. Last year around 300,000 Americans visited Russia, said Nikolay Novichkov, deputy head of the Federal Agency for Tourism of the Russian Federation. He said that the majority traveled in tour groups, but that the Russian government is launching programs to attract more individual tourists. “We are trying to create an infrastructure where there will be no need to talk to a tour operator, and tourists will be able to book hotels and buy tickets online,” said Novichkov. The main step, he said, is to provide information in English, and there are a growing number of information centers with English assistance all over Russia. “But this is a long ongoing process that we are working on,” Novichkov added. In terms of exhibits, Russia did not disappoint. There was, of course, the usual information on the most popular trips to Moscow and St. Petersburg as well as the famous two-week-long Trans Siberian Express. The Federal Agency for Tourism also presented new destinations: Dombai, a ski resort in the North Caucasus popular with Russians; the Museum of the USSR in Ulyanovsk; and Shantar Islands on the Eastern Siberian Coast. Dombai, located on a Caucasus mountain ridge in Southern Russia, a longtime favorite with Russians, has new ambitions to attract international guests to its fully equipped slopes. The local administration plans to launch another ski-resort destination in Arkhyz by 2015. Arkhyz is a tiny mountain village close to the Black Sea. Arkhyz is featured in a recent documentary Eye of the Storm with three famous European “freeriders” – Thibaud Duchosal, Enak Gavaggio, and Phil Meier – conquering ferocious Caucasian mountains. Dombai is located within the Karachai-Cherkess Republic, which became part of the Russian Empire in the beginning of the 19th century to ensure its protection from attack. A two-hour flight from Moscow to Mineralni Vodi and then a short bus ride brings tourists to the ski resort. Apart from breathtaking mountain views, the area is famous for its lamb kebabs and underground springs. “There are a lot of interesting artifacts in Russia but many of them are sitting in storage,” said Sergey Lakovsky, director at the Tourism Center in Ulyanovsk. After the fall of the Soviet Union, many monuments to Lenin, once elevated at the main square of every city, were dismantled. Now, after two decades, people want to preserve the history. The new museum in Ulyanovsk is being built to chronicle the saga of statues and artifacts once celebrated and now scattered. “I guess the most interesting artifact that we would want to see there (in the museum) is Vladimir Lenin himself. We think he should leave the Red Square and be buried in his motherland,” said Lakovsky. Vladimir Lenin, who was born Vladimir Ulyanov, was born in this city. The city’s name was changed from Simbirsk to Ulyanovsk in 1924. One of the important historical artifacts that museum has is Stalin’s smoking pipe, which became an integral part of Stalin’s image. The first impression of the legendary Soviet poster “Motherland is Calling” is also in the museum’s collection. This propaganda poster encouraged Russians to enlist during World War II. There are still vast swaths of Russia that are relatively unexplored. The Shantar Islands on the sea of Okhotsk in the Far East is one of those locales. The islands are fairly unpopulated – except for bears – and the water is frozen for much of the year as the islands see the first snow as early as September. The islands are also a popular fishing destination. Visitors at the travel exposition were interested in practical issues, like the visa process and travel maps of Saint Petersburg. Some of them have never been to Russia, but are planning to go during the next few years, like Andrew Wiens, a sales manager from California. Some of them have been to Russia and are planning on visiting again, like New Yorker Kieth Sherman.